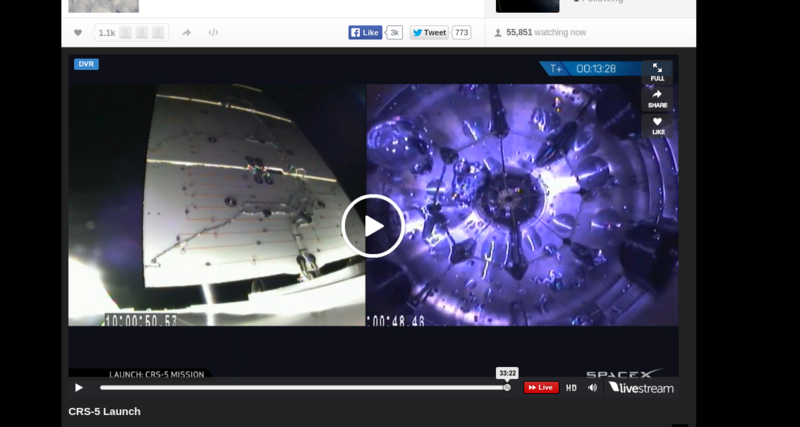 I'm currently watching the live stream of the CRS-5 launch. They've been cycling through several different camera angles including one which looks a lot like bubbles in water, or perhaps blobs of water floating without gravity. I was wondering what this footage is showing? That's from within the propellants tanks of the upper stage after Dragon separation and the microgravity environment saying hello. Lack of acceleration (stage engine is shut off during separation) acting on propellants when looking at them from inertial frame of reference (the tank itself) means they're essentially in free-fall together with the stage propellant tank they're in. With a slight kick of the Dragon separation, propellants have sloshed and that produced droplets of the liquid fuel and oxidizer (the first image shows the RP-1 fuel tank, the other two the liquid cryogenic oxygen, or LOX tank, while the embedded video interchangeably shows both) within the tanks, interacting with each other while no other external force acts on them any different than the stage itself. Once the stage engine is reignited, some acceleration is introduced back to the tank and it essentially catches up with the propellants, forcing them towards the aft of tanks in the opposite direction to the stage's acceleration vector. As a corollary, this is the reason why some upper stages require separate ullage motors to push propellants back towards the aft of the tank, while others might use different systems to achieve that, like with attitude control system's vernier thrusters for a slight stage kick, a wick within the tank that supplies fuel through their surface tension, or pressurant ullage gas and a membrane (aka a bladder) to provide propellants pressure in the feed line. While TildalWave's answer is mostly correct, he missed one important thing. This is not the RP-1 fuel, it's Liquid Oxygen, the oxidizer - floating in microgravity after the Merlin 1D Vacuum engine shutoff. There are two very clear giveaways for this. RP-1 has a yellowish hue, whereas Liquid Oxygen has a more characteristic blue color, which can be seen in these images taken from the top of the LOX tank. The RP-1 tank has an insulated pipe from the LOX tank above running through it, to facilitate the delivery of LOX to the Merlin engine. No such pipe is seen in this picture. And yes, as TildalWave also mentioned, small ullage motors are commonly used to "push" the fuel back down to the outlet of the tank, by inducing a tiny forward accelaration on the stage. In Falcon 9's case, pressurized Nitrogen delivered via cold gas thrusters is used to provide this kick. Some rockets, such as the Delta IV, use solid motors. Not the answer you're looking for? Browse other questions tagged launch spacex upper-stage or ask your own question. SpaceX Webcast - What is visible in this clip? 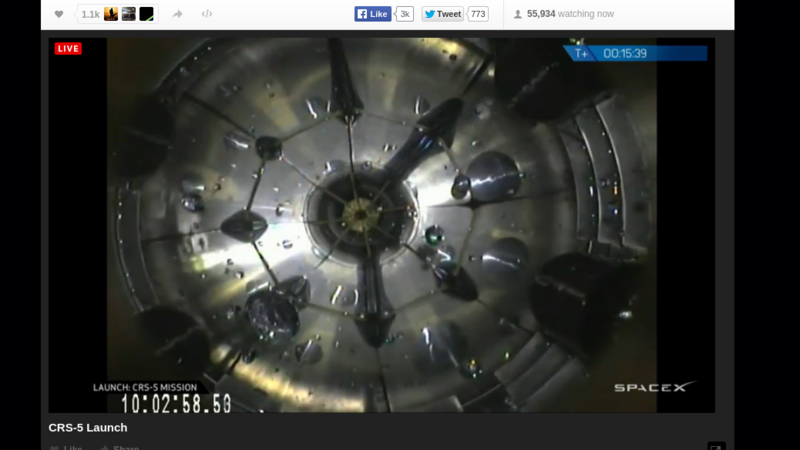 What view of the Falcon 9 does this screenshot show? Will we see the barge landing live during the SpaceX CRS-5 webcast? 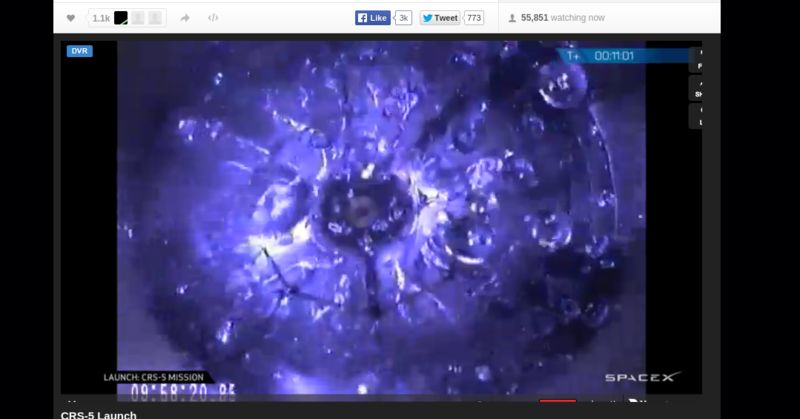 What happens when a rocket explodes (specifically, the SpaceX CRS-7 mission)?